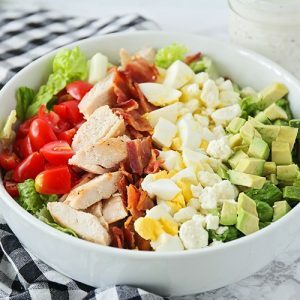 This classic Cobb salad is so fresh and delicious – it is the perfect summer meal! It’s loaded with protein, and it’s quick and easy to make. Now that summer is finally here, it’s time to break out the main dish salads! When it’s boiling hot outside, the last thing I want to do is heat up the oven (and therefore the rest of my house). 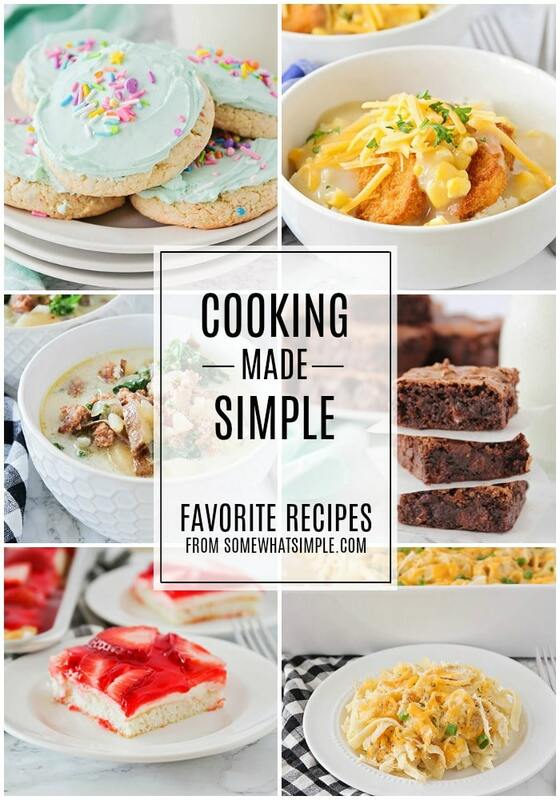 During the summer, my family loves to eat simple and quick meals, using fresh ingredients whenever possible. 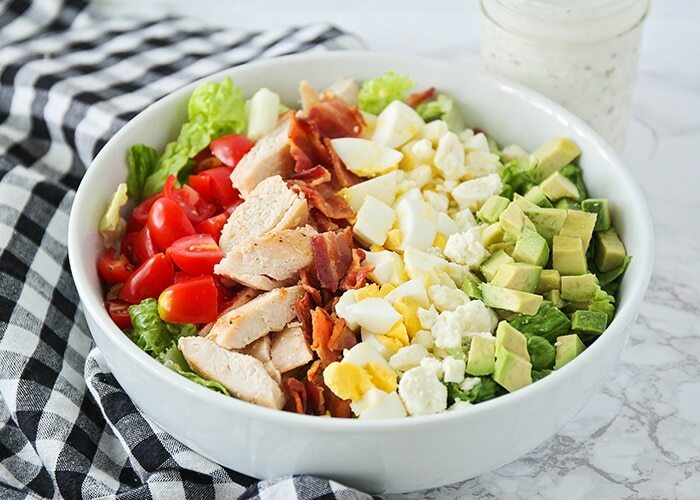 This delicious classic Cobb salad is just that! It’s loaded with protein, it’s super quick to make, and so delicious that it’s sure to be a favorite with the whole family. It’s one of my family’s favorite summer meals! 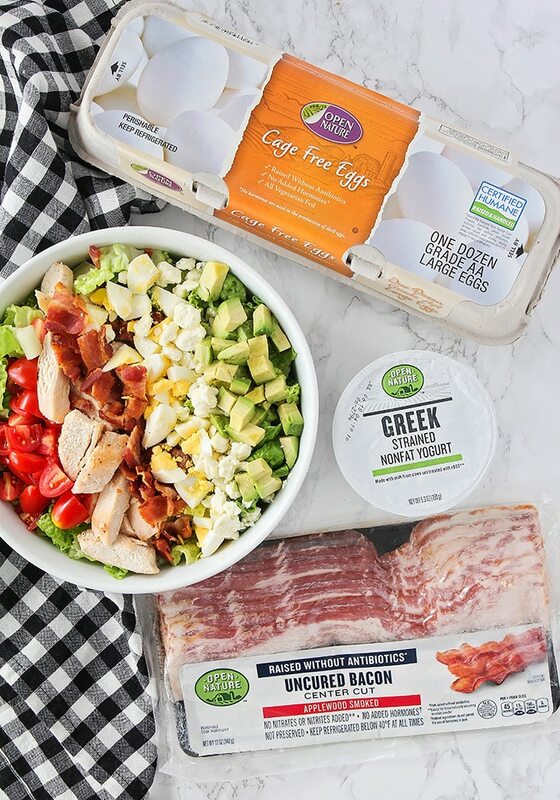 To make a great salad, you need to start with great ingredients, and that’s why I love to use Open Nature™ products, available exclusively at Albertsons and Safeway. They’re minimally processed, with no artificial colors, flavors, sweeteners, or preservatives. Open Nature is a distinct brand dedicated to the clean lifestyle, and has a wide variety of products across the entire store. They are very high quality, and available at a lower price than competitor clean brands. They are products you can feel good about! I buy my Open Nature products at my local Albertsons and Safeway, and you can also find them exclusively at all of the Albertsons Companies family of stores, including ACME Markets, Jewel-Osco, Vons, Pavilions, Randalls, Tom Thumb, Shaw’s, Star Market, and Carrs/Safeway. 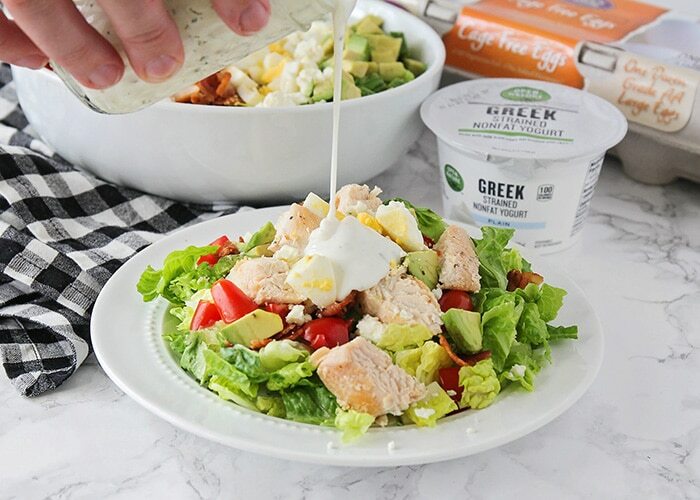 Visit Albertsons.com or Safeway.com to find a store near you and discover more meal prep tips and recipe ideas. This classic Cobb salad takes only a few minutes of hands-on time to make, so it’s perfect for a busy night. You’ll start by making the delicious homemade ranch dressing. 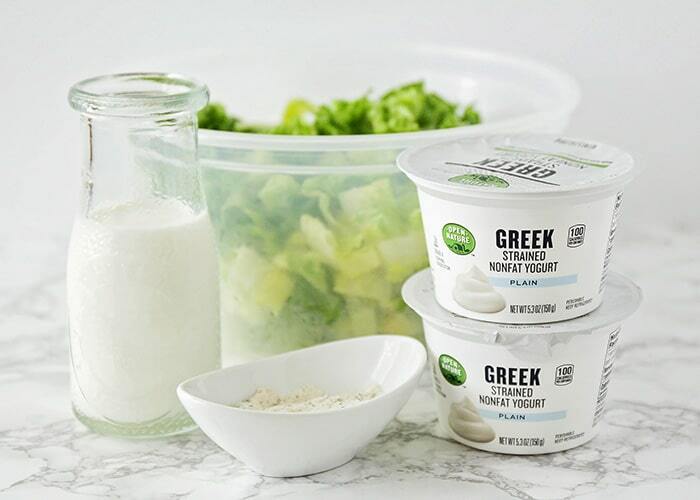 Just whisk together nonfat Greek yogurt, milk, and ranch dressing mix in a small bowl or jar, then refrigerate for at least 30 minutes to allow the dressing to thicken and the flavors to blend. This homemade ranch dressing is one of my kids’ favorite foods, and they eat it on everything, from fresh veggies to chicken nuggets. Yum! While the salad dressing is chilling, you’ll chop the remaining ingredients and assemble your salad. I like to lay each ingredient out separately so that it looks pretty, but if you’re not arranging it for a photo, you can just toss everything together. If you’re making this salad ahead of time, I would suggest waiting to chop the avocado until just before you’re ready to serve. 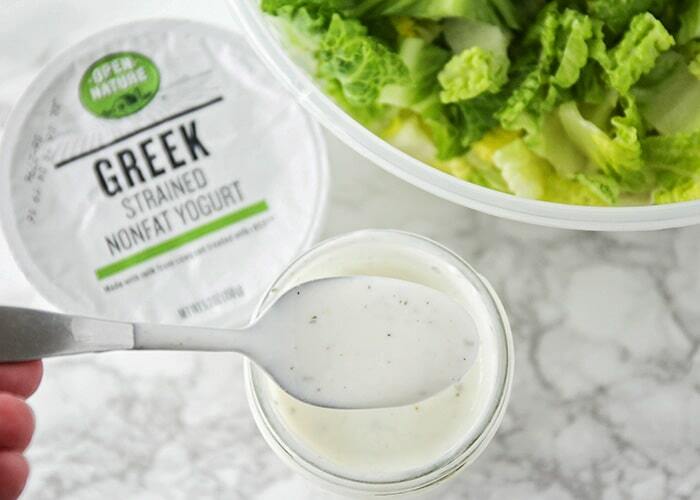 Serve up your salad, then drizzle some of that delicious ranch dressing over the top! So good! 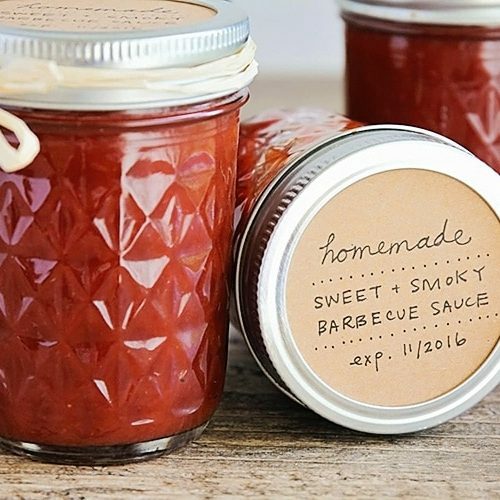 You could easily double or triple the recipe if you’re making it for a crowd, and it would be perfect for a summer barbecue or potluck. It’s definitely a crowd pleaser! 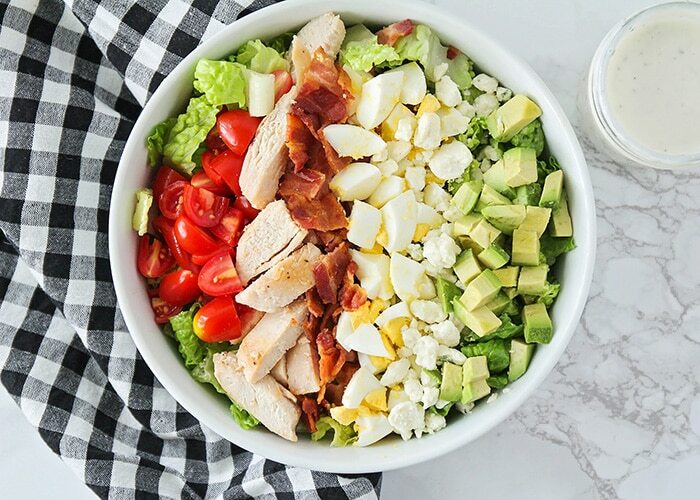 This classic cobb salad has the perfect combination of flavors, and tastes amazing. It’s a delicious main dish salad that’s easy to make! 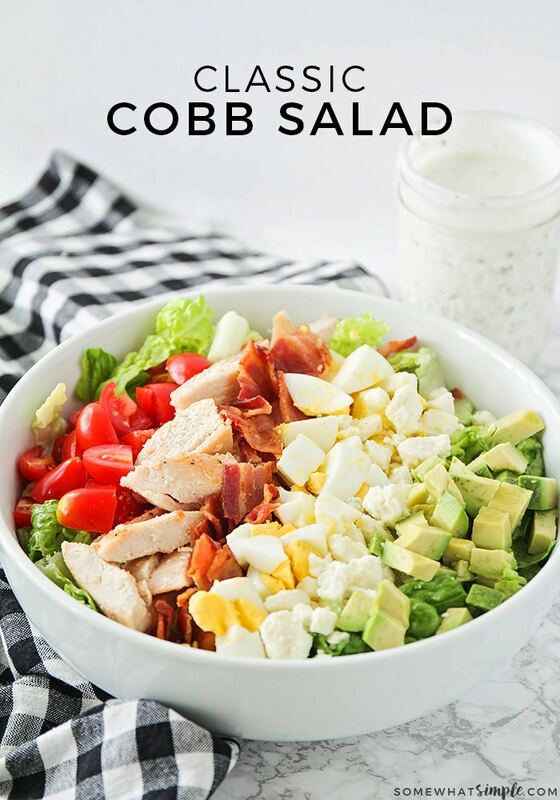 This classic Cobb salad is so fresh and delicious, and is the perfect summer meal! It's loaded with protein, and quick and easy to make. To make the dressing, whisk together all ingredients in a small bowl or jar, until smooth. 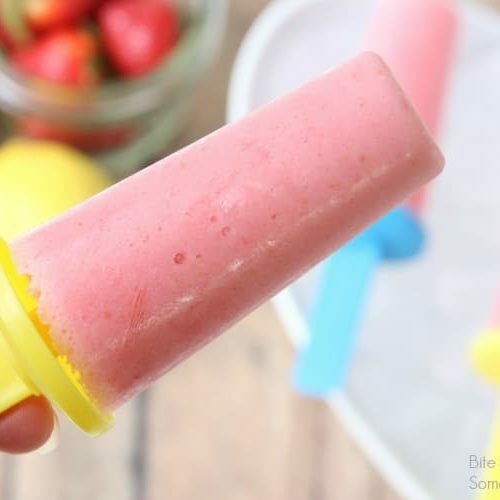 Refrigerate at least 30 minutes, or until ready to serve. To make the salad, place the lettuce in a large serving bowl. 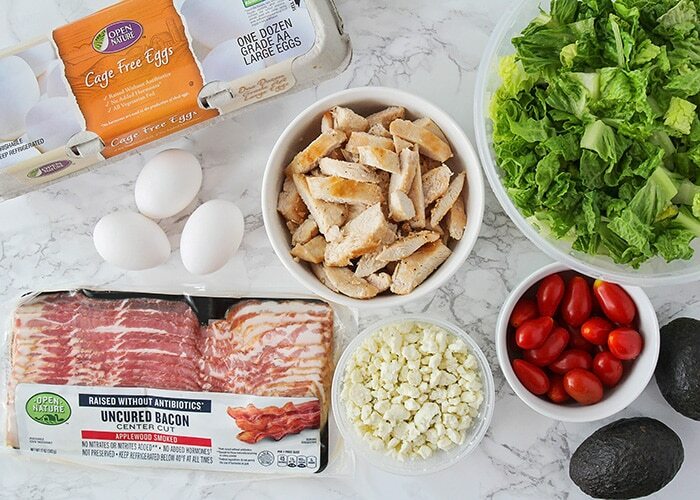 Add the chicken, bacon, boiled eggs, blue cheese, tomatoes, and avocado. Serve immediately, drizzled with ranch dressing. One of my favorite salads ever! So fresh and delicious! I’m with you, this is my favorite salad of all time! This might be my all time favorite salad, I just love all the toppings. And having a good dressing always makes it better. 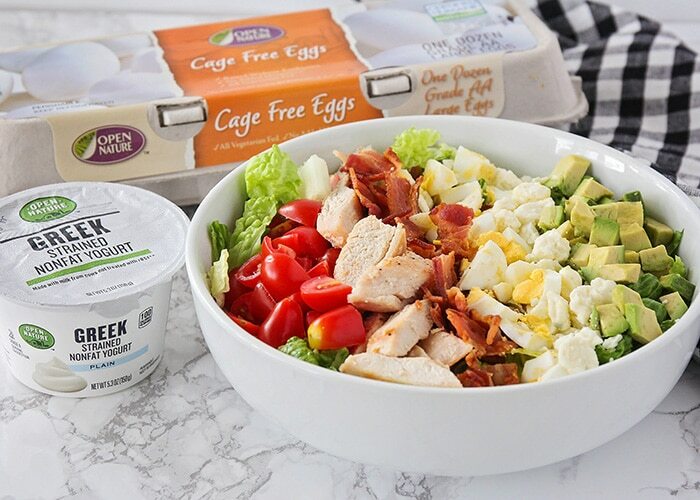 Totally agree…Cobb salads definitely have the best toppings! This is so hearty and has been perfect for lunches! I’m with you…if I could have this for lunch every day, I would! This is my go-to salad! 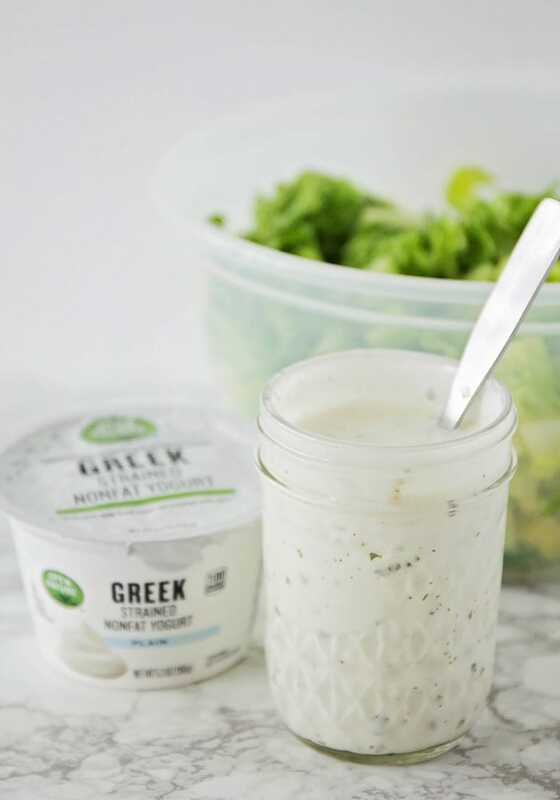 I love using Greek yogurt for dressings too! This is one of our favorite salads! I mean, it includes bacon which is always a winner to us!